Molecular structure of the 30S Subunit from Thermus thermophilus. Proteins are shown in blue and the single RNA strand in orange. 16S ribosomal RNA (or 16S rRNA) is the component of the 30S small subunit of a prokaryotic ribosome that binds to the Shine-Dalgarno sequence. The genes coding for it are referred to as 16S rRNA gene and are used in reconstructing phylogenies, due to the slow rates of evolution of this region of the gene. Carl Woese and George E. Fox were two of the people who pioneered the use of 16S rRNA in phylogenetics in 1977. Multiple sequences of the 16S rRNA gene can exist within a single bacterium. The 16S rRNA gene is used for phylogenetic studies as it is highly conserved between different species of bacteria and archaea. Carl Woese pioneered this use of 16S rRNA. It is suggested that 16S rRNA gene can be used as a reliable molecular clock because 16S rRNA sequences from distantly related bacterial lineages are shown to have similar functionalities. Some (hyper)thermophilic archaea (i.e. order Thermoproteales) contain 16S rRNA gene introns that are located in highly conserved regions and can impact the annealing of "universal" primers. Mitochondrial and chloroplastic rRNA are also amplified. In addition to highly conserved primer binding sites, 16S rRNA gene sequences contain hypervariable regions that can provide species-specific signature sequences useful for identification of bacteria. As a result, 16S rRNA gene sequencing has become prevalent in medical microbiology as a rapid and cheap alternative to phenotypic methods of bacterial identification. Although it was originally used to identify bacteria, 16S sequencing was subsequently found to be capable of reclassifying bacteria into completely new species, or even genera. It has also been used to describe new species that have never been successfully cultured. With Third-generation sequencing coming to many labs, simultaneous identification of thousands of 16S rRNA sequences is possible within hours, allowing metagenomic studies, for example of the gut flora. The bacterial 16S gene contains nine hypervariable regions (V1-V9) ranging from about 30-100 base pairs long that are involved in the secondary structure of the small ribosomal subunit. The degree of conservation varies widely between hypervariable regions, with more conserved regions correlating to higher-level taxonomy and less conserved regions to lower levels, such as genus and species. While the entire 16S sequence allows for comparison of all hypervariable regions, at approximately 1500 base pairs long it can be prohibitively expensive for studies seeking to identify or characterize diverse bacterial communities. These studies commonly utilize the Illumina platform, which produces reads at rates 50-fold and 12,000-fold less expensive than 454 pyrosequencing and Sanger sequencing, respectively. While cheaper and allowing for deeper community coverage, Illumina sequencing only produces reads 75-250 base pairs long (up to 300 base pairs with Illumina MiSeq), and has no established protocol for reliably assembling the full gene in community samples. Full hypervariable regions can be assembled from a single Illumina run, however, making them ideal targets for the platform. While 16S hypervariable regions can vary dramatically between bacteria, the 16S gene as a whole maintains greater length homogeneity than its Eukaryotic counterpart, which can make alignments easier. Additionally, the 16S gene contains highly conserved sequences between hypervariable regions, enabling the design of universal primers that can reliably produce the same sections of the 16S sequence across different taxa. Although no hypervariable region can accurately classify all bacteria from Domain to Species, some can reliably predict specific taxonomic levels. Many community studies select semi-conserved hypervariable regions like the V4 for this reason, as it can provide resolution at the phylum level as accurately as the full 16S gene. While lesser-conserved regions struggle to classify new species when higher order taxonomy is unknown, they are often used to detect the presence of specific pathogens. In one study by Chakravorty et al. in 2007, they characterized the V1-V8 regions of a variety of pathogens in order to determine which hypervariable regions would be most useful to include for disease-specific and broad assays. Amongst other findings, they noted that the V3 region was best at identifying the genus for all pathogens tested, and that V6 was the most accurate at differentiating species between all CDC-watched pathogens tested, including Anthrax. While 16S hypervariable region analysis is a powerful tool for bacterial taxonomic studies, it struggles to differentiate between closely related species. In the families Enterobacteriaceae, Clostridiaceae, and Peptostreptococcaceae, species can share up to 99% sequence similarity across the full 16S gene. As a result, the V4 sequences can differ by only a few nucleotides, leaving reference databases unable to reliably classify these bacteria at lower taxonomic levels. By limiting 16S analysis to select hypervariable regions, these studies can fail to observe differences in closely related taxa and group them into single taxonomic units, therefore underestimating the total diversity of the sample. Furthermore, bacterial genomes can house multiple 16S genes, with the V1, V2, and V6 regions containing the greatest intraspecies diversity. While not the most precise method of classifying bacterial species, analysis of the hypervariable regions remains one of the most useful tools available to bacterial community studies. https://www.ezbiocloud.net/ EzBioCloud database, formerly known as EzTaxon, consists of a complete hierarchical taxonomic system containing 62,988 bacteria and archaea species/phylotypes which includes 15,290 valid published names as of September 2018. Based on the phylogenetic relationship such as maximum-likelihood and OrthoANI, all species/subspecies are represented by at least one 16S rRNA gene sequence. The EzBioCloud database is systematically curated and updated regularly which also includes novel candidate species. Moreover, the website provides bioinformatics tools such as ANI calculator, ContEst16S and 16S rRNA DB for QIIME and Mothur pipeline. 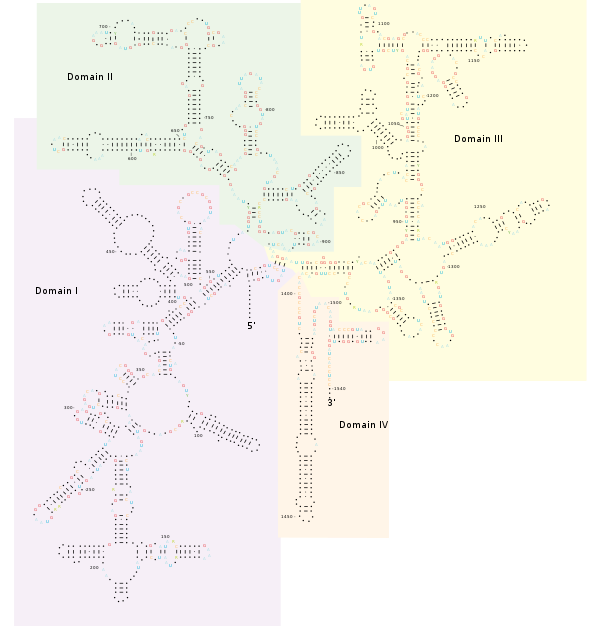 SILVA provides comprehensive, quality checked and regularly updated datasets of aligned small (16S/18S, SSU) and large subunit (23S/28S, LSU) ribosomal RNA (rRNA) sequences for all three domains of life as well as a suite of search, primer-design and alignment tools (Bacteria, Archaea and Eukarya). ^ Schluenzen F, Tocilj A, Zarivach R, Harms J, Gluehmann M, Janell D, Bashan A, Bartels H, Agmon I, Franceschi F, Yonath A (September 2000). "Structure of functionally activated small ribosomal subunit at 3.3 angstroms resolution". Cell. 102 (5): 615–23. doi:10.1016/S0092-8674(00)00084-2. PMID 11007480. ^ Woese CR, Kandler O, Wheelis ML (June 1990). "Towards a natural system of organisms: proposal for the domains Archaea, Bacteria, and Eucarya". Proceedings of the National Academy of Sciences of the United States of America. 87 (12): 4576–9. Bibcode:1990PNAS...87.4576W. doi:10.1073/pnas.87.12.4576. PMC 54159. PMID 2112744. ^ Case RJ, Boucher Y, Dahllöf I, Holmström C, Doolittle WF, Kjelleberg S (January 2007). "Use of 16S rRNA and rpoB genes as molecular markers for microbial ecology studies". Applied and Environmental Microbiology. 73 (1): 278–88. doi:10.1128/AEM.01177-06. PMC 1797146. PMID 17071787. ^ a b c Weisburg WG, Barns SM, Pelletier DA, Lane DJ (January 1991). "16S ribosomal DNA amplification for phylogenetic study". Journal of Bacteriology. 173 (2): 697–703. doi:10.1128/jb.173.2.697-703.1991. PMC 207061. PMID 1987160. ^ a b Coenye T, Vandamme P (November 2003). "Intragenomic heterogeneity between multiple 16S ribosomal RNA operons in sequenced bacterial genomes". FEMS Microbiology Letters. 228 (1): 45–9. doi:10.1016/S0378-1097(03)00717-1. PMID 14612235. ^ Tsukuda, Miyuki; Kitahara, Kei; Miyazaki, Kentaro (2017-08-30). "Comparative RNA function analysis reveals high functional similarity between distantly related bacterial 16 S rRNAs". Scientific Reports. 7 (1): 9993. Bibcode:2017NatSR...7.9993T. doi:10.1038/s41598-017-10214-3. ISSN 2045-2322. PMC 5577257. PMID 28855596. Archived from the original on 2018-05-15. ^ Jay ZJ, Inskeep WP (July 2015). "The distribution, diversity, and importance of 16S rRNA gene introns in the order Thermoproteales". Biology Direct. 10 (35): 35. doi:10.1186/s13062-015-0065-6. PMC 4496867. PMID 26156036. ^ "Primers, 16S ribosomal DNA - François Lutzoni's Lab". lutzonilab.net. Archived from the original on 2012-12-27. ^ a b Eden PA, Schmidt TM, Blakemore RP, Pace NR (April 1991). "Phylogenetic analysis of Aquaspirillum magnetotacticum using polymerase chain reaction-amplified 16S rRNA-specific DNA". International Journal of Systematic Bacteriology. 41 (2): 324–5. doi:10.1099/00207713-41-2-324. PMID 1854644. ^ a b James, Greg (15 May 2018). "Universal Bacterial Identification by PCR and DNA Sequencing of 16S rRNA Gene". PCR for Clinical Microbiology. Springer, Dordrecht. pp. 209–214. doi:10.1007/978-90-481-9039-3_28. ISBN 978-90-481-9038-6. ^ a b Weidner S, Arnold W, Pühler A (1996). "Diversity of uncultured microorganisms associated with the seagrass Halophila stipulacea estimated by restriction fragment length polymorphism analysis of PCR-amplified 16S rRNA genes" (PDF). Appl Environ Microbiol. 62 (3): 766–71. PMC 167844. PMID 8975607. Archived (PDF) from the original on 2011-07-15. ^ a b Jiang H, Dong H, Zhang G, Yu B, Chapman LR, Fields MW (June 2006). "Microbial diversity in water and sediment of Lake Chaka, an athalassohaline lake in northwestern China". Applied and Environmental Microbiology. 72 (6): 3832–45. doi:10.1128/AEM.02869-05. PMC 1489620. PMID 16751487. ^ Pereira F, Carneiro J, Matthiesen R, van Asch B, Pinto N, Gusmão L, Amorim A (December 2010). "Identification of species by multiplex analysis of variable-length sequences". Nucleic Acids Research. 38 (22): e203. doi:10.1093/nar/gkq865. PMC 3001097. PMID 20923781. ^ Kolbert CP, Persing DH (June 1999). "Ribosomal DNA sequencing as a tool for identification of bacterial pathogens". Current Opinion in Microbiology. 2 (3): 299–305. doi:10.1016/S1369-5274(99)80052-6. PMID 10383862. ^ Clarridge JE (October 2004). "Impact of 16S rRNA gene sequence analysis for identification of bacteria on clinical microbiology and infectious diseases". Clinical Microbiology Reviews. 17 (4): 840–62, table of contents. doi:10.1128/CMR.17.4.840-862.2004. PMC 523561. PMID 15489351. ^ Lu T, Stroot PG, Oerther DB (July 2009). "Reverse transcription of 16S rRNA to monitor ribosome-synthesizing bacterial populations in the environment". Applied and Environmental Microbiology. 75 (13): 4589–98. doi:10.1128/AEM.02970-08. PMC 2704851. PMID 19395563. ^ Brett PJ, DeShazer D, Woods DE (January 1998). "Burkholderia thailandensis sp. nov., a Burkholderia pseudomallei-like species". International Journal of Systematic Bacteriology. 48 Pt 1 (1): 317–20. doi:10.1099/00207713-48-1-317. PMID 9542103. ^ Schmidt TM, Relman DA (1994). Phylogenetic identification of uncultured pathogens using ribosomal RNA sequences. Methods in Enzymology. 235. pp. 205–22. doi:10.1016/0076-6879(94)35142-2. ISBN 978-0-12-182136-4. PMID 7520119. ^ Gray JP, Herwig RP (November 1996). "Phylogenetic analysis of the bacterial communities in marine sediments". Applied and Environmental Microbiology. 62 (11): 4049–59. PMC 168226. PMID 8899989. ^ Sanschagrin S, Yergeau E (2014). "Next-generation sequencing of 16S ribosomal RNA gene amplicons". J Vis Exp (90). doi:10.3791/51709. PMC 4828026. PMID 25226019. ^ Gray MW, Sankoff D, Cedergren RJ (1984). "On the evolutionary descent of organisms and organelles: a global phylogeny based on a highly conserved structural core in small subunit ribosomal RNA". Nucleic Acids Research. 12 (14): 5837–52. doi:10.1093/nar/12.14.5837. PMC 320035. PMID 6462918. ^ a b c d Yang B, Wang Y, Qian PY (March 2016). "Sensitivity and correlation of hypervariable regions in 16S rRNA genes in phylogenetic analysis". BMC Bioinformatics. 17 (1): 135. doi:10.1186/s12859-016-0992-y. PMC 4802574. PMID 27000765. ^ Bartram AK, Lynch MD, Stearns JC, Moreno-Hagelsieb G, Neufeld JD (June 2011). "Generation of multimillion-sequence 16S rRNA gene libraries from complex microbial communities by assembling paired-end illumina reads". Applied and Environmental Microbiology. 77 (11): 3846–52. doi:10.1128/AEM.02772-10. PMC 3127616. PMID 21460107. ^ a b Burke CM, Darling AE (2016-09-20). "A method for high precision sequencing of near full-length 16S rRNA genes on an Illumina MiSeq". PeerJ. 4: e2492. doi:10.7717/peerj.2492. PMC 5036073. PMID 27688981. ^ Van de Peer Y, Chapelle S, De Wachter R (1996). "A quantitative map of nucleotide substitution rates in bacterial rRNA". Nucleic Acids Research. 24 (17): 3381–91. doi:10.1093/nar/24.17.3381. PMC 146102. PMID 8811093. ^ a b c Větrovský T, Baldrian P (2013-02-27). "The variability of the 16S rRNA gene in bacterial genomes and its consequences for bacterial community analyses". PLoS One. 8 (2): e57923. Bibcode:2013PLoSO...857923V. doi:10.1371/journal.pone.0057923. PMC 3583900. PMID 23460914. ^ a b Chakravorty S, Helb D, Burday M, Connell N, Alland D (May 2007). "A detailed analysis of 16S ribosomal RNA gene segments for the diagnosis of pathogenic bacteria". Journal of Microbiological Methods. 69 (2): 330–9. doi:10.1016/j.mimet.2007.02.005. PMC 2562909. PMID 17391789. ^ a b c Jovel J, Patterson J, Wang W, Hotte N, O'Keefe S, Mitchel T, Perry T, Kao D, Mason AL, Madsen KL, Wong GK (2016-01-01). "Characterization of the Gut Microbiome Using 16S or Shotgun Metagenomics". Frontiers in Microbiology. 7: 459. doi:10.3389/fmicb.2016.00459. PMC 4837688. PMID 27148170. ^ Larsen N, Olsen GJ, Maidak BL, McCaughey MJ, Overbeek R, Macke TJ, Marsh TL, Woese CR. (1993) The ribosomal database project. Nucleic Acids Res. Jul 1;21(13):3021-3. ^ Elmar Pruesse, Christian Quast, Katrin Knittel, Bernhard M. Fuchs, Wolfgang Ludwig, Jörg Peplies, Frank Oliver Glöckner (2007) Nucleic Acids Res. SILVA: a comprehensive online resource for quality checked and aligned ribosomal RNA sequence data compatible with ARB. December; 35(21): 7188–7196. ^ DeSantis TZ, Hugenholtz P, Larsen N, Rojas M, Brodie EL, Keller K, Huber T, Dalevi D, Hu P, Andersen GL (July 2006). "Greengenes, a chimera-checked 16S rRNA gene database and workbench compatible with ARB". Applied and Environmental Microbiology. 72 (7): 5069–72. doi:10.1128/aem.03006-05. PMC 1489311. PMID 16820507. ^ McDonald D, Price MN, Goodrich J, Nawrocki EP, DeSantis TZ, Probst A, Andersen GL, Knight R, Hugenholtz P (March 2012). "An improved Greengenes taxonomy with explicit ranks for ecological and evolutionary analyses of bacteria and archaea". The ISME Journal. 6 (3): 610–8. doi:10.1038/ismej.2011.139. PMC 3280142. PMID 22134646.